It’s tried and true: Personalization works in marketing. You know this already – approach your consumers as individuals and reap compelling results. However, tailoring campaigns can call for plenty of pain and patience along the way due to the journey of implementing new technology and complex techniques. 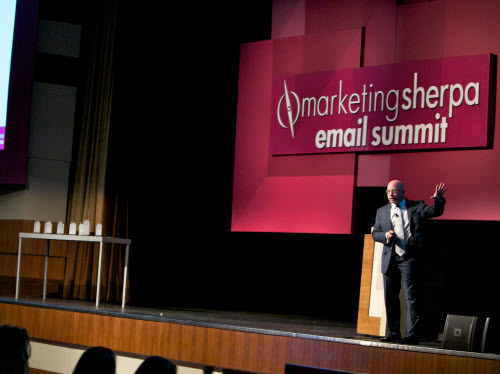 But the attendees in the General Session Room of the Aria Resort & Casino Las Vegas at MarketingSherpa Email Summit 2014 learned that there’s a loophole to this. It’s possible (and realistic) to actually gain the benefit of personalization minus the heavy lifting. Flint McGlaughlin, Managing Director, MECLABS, kicked off Day 2 of Summit with his session, “Interactive Quick-Win Clinic: 3 simple email tactics to achieve personalization without the need for complex technology.” He set out to shed light on how to achieve the highest possible yield with the least amount of energy. Two points of focus in Flint’s session were how to achieve this via subject lines and headlines. Flint explained that although something may be considered both relevant and important, the item that is the most urgent gets opened. Thus, establishing urgency in your email is key. Flint likens the headline of an email to a pick-up line. The headline begins the conversation with your recipient and, not surprisingly, its wording is essential. Because a headline is part of a conversation, it doesn’t work when it’s not a sentence. In other words (no pun intended), don’t speak in bullet points. After all, would you do that in a real-life conversation? “[Speaking in bullet points] would leave me playing by myself on the playground,” Flint joked. He examined the wording of select headlines tested for a survey company. The findings illustrated that headlines with a “point-first” design garnered the highest performance. These were the headlines that focused on what the consumer “got” – they were value-centric. Set Up Your FREE Account Today and Start Earning Money! We as marketers, Flint explained, have developed a whole language called, “marketing speak.” However, though marketers use this in their marketing copy, they certainly don’t use it in their conversations in their lives, so to speak. The headline has a specific duty: to give the recipient a “need to read.” If your headline doesn’t do this, then it’s not doing its job, Flint explained.